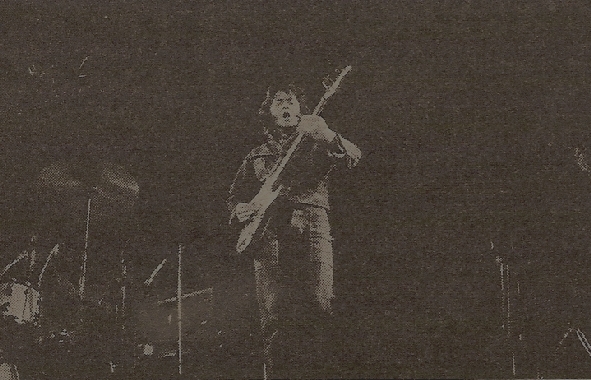 One of the most impressive concerts of 1973 took place on Saturday 14 December in the Rotterdam “Doelen”, where the Irish guitarist freak Rory Gallagher was up and about for almost three hours with all kind of guitars and a mandolin. Gallagher’s simply structured music, supported by a firm base with the tremendous drummer, Rod De’Ath, and the, in a practically impossible leg position operating bass player, Gerry McAvoy, soon freed the legs, hands and throats of the audience, that gave Gallagher enough inspiration to give, for example, an extra of a little over a half hour. Inspiration and persistence form two firm pillars at the concerts of Gallagher: Those who are not pleased to pieces by the music itself are without doubt impressed by the extensive repertoire, Rory's many abilities on the guitar or the unflagging tempo. Beside some monumental band songs (“Bullfrog Blues”, “Messin' With The Kid”, “I Wanna Boogie”, “Hands Off”) Gallagher also brought a little less than half an hour of acoustic music using a National steel guitar, an acoustic one and played the harp with a neck rack plus the mandolin. Above all, with this last instrument (used in "Goin' to My Home Town") he knew how to create, surprising swinging music: Honest, sympathetic and firmly rhythmic. In fact, the whole concert had something engaging: Gallagher gives value for money; he acts without the “attitude of being a star” and simply delivers fine music. Gradually his image is his chequered shirt, his blue jeans, the two very old Fender guitars and his unaffected act that, when put together, is a fine antithesis of the many glitter and glamour acts in nowadays pop. The band Strider, a student-like beat-band that produced a little too read up music, supplied the support act for Gallagher. The band did not impress much. This article was translated by Johan Schoot Uiterkamp who passed this message along regrading the show. "The article gives the date 14-December-1973. The concert was a Saturday night concert; the next day was Sunday 15-December-1973 (Joachim’s list). That Sunday was a so-called “Car Free Sunday”. Due the oil-crises in 1973, the Dutch government decided not to use the cars on Sunday in order to save fuel. The story goes Rory plays that long so the people at the concert could leave Rotterdam with the first train in the morning."